Registration is now open for the Ruth Beals Cup regatta, scheduled for Saturday morning, November 12, at Tempe Town lake. 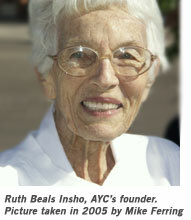 This once-a-year regatta is organized to honor AYC’s founder, Ruth Beals, who passed away in November 2010. Rules of the event require a woman at the helm and up to a dozen will face off in C14s, using either their own boats or an ASF C14. The crew can be either male or female. The Notice of Race and Entry Form are now available on the AYC race page. Scroll down the page until you see the Ruth Beals information. Contact Race Organizer Pat Blumm to reserve your spot and then arrange to get him the entry form. There is no fee for entry and there are prizes for the top finishers: gift certificates for purchases in the AYC Ship Store.